For most pet lovers, dogs are a part of your family and as their owner; you are responsible for their safety both in your home and in your vehicle. Although there currently aren’t any state mandated car seat regulations for dogs, if you consider your pet a family member you should invest in a car seat for dogs to protect them, as well as other passengers and you when they are in a moving vehicle. In case of an emergency stop or an accident, your dog could become a projectile traveling at high speed when you are suddenly stopped. The impact could send your dog flying through a window, or into another passenger which could result in a medical emergency for both! They also lesson the opportunity for distraction. Pets moving around the vehicle or trying to jump out the window can be very distracting to drivers and could potentially cause an accident. The safest car seats for dogs are directly related to their size, and most models require your dog to be fitted with a harness that will attach to it. If you attach your dog, no matter their size or weight, by their collar they can easily become choked or suffer a broken neck in a car accident. 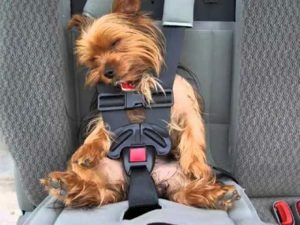 Thus it is important to purchase a harness that can be used while walking your dog, or putting them in their car seat. Be sure the harness you choose goes around the dog’s chest, waist and shoulders and not around its neck. One of the safest types of car seats for small or average dog breeds are the detachable carriers. These are used for dogs that travel often. There is a dog car seat base that attaches to your car’s seat by the seatbelt and remains in the car. It then has a carrier that snaps in and out of the base, making it easy to take the dog in and out without having to reinstall the whole car seat. They can also be used as your pet’s crate or sleeping area as well. This convertible feature is popular for people who take their pet on vacation or on trips with them. They also have a door that opens at the top of the carrier to check on your pet without them getting out. Another type of car seats for dogs is the basic canvas cube that attaches to your car’s seatbelt. These are also for both small and average sized dogs as well as large breed dogs. The cube has an attachment for hooking your dog’s safety harness to. For small breeds, the cube often comes with a booster seat inside so your dog will be able to see out the window. For larger dogs the cube tends to be deeper making it less likely that your dog will fall out. Car seats for dogs can also extend across the backseat like a bench as a booster for multiple small or average sized dogs. These are usually attached to the car’s head rest and have multiple attachments for hooking up more than one dog at a time. The bench adds height to the seat so the dogs can see out the windows. A similar design that is used for larger breeds is a car seat cover for dogs that attaches to the head rests on the backseat and to the front seat making a hammock. This helps protect your car seats and prevents the dog from moving about the vehicle and falling onto the floor with a sudden stop. If you have considered getting a car seat for dogs, be sure to do your research. It is best to find one that is easy to install and fits the size of your dogs. Like infant car seats, it’s best to keep your dog(s) in the back seat to avoid distraction and protect them from your vehicle’s airbags.